Looking for a sweet something for yourself or your favorite hippo collector? Your search is over! 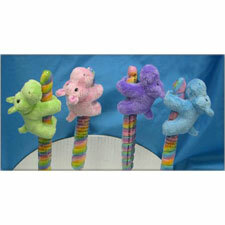 We've got darling mini plush hippo stuffed animals that cling to an old-fashioned candy stick or twisty pop. This makes a perfect stocking stuffer at the holidays or a tasty Valentine's Day treat. After the candy is gone, you get to keep the hippo! Hippos measure about 4" long and come in assorted colors; please give us your color preference at checkout or allow us to choose for you.